This is my speed, compared to MrZippy's it's a snail, I used his tester then Okla. When I download I can't even measure the speed. I understand the 50k limit, but given the vast increase in file size for the average download in the past twenty years it is time to consider raising it. Non-paying members are more penalized now than back then by this. I recall downloading a B-58 for FS98 which at just under 5meg was a huge d/l back then. But a complete aircraft today for FS9 or FSX is easily 50meg+, which is quite onerous at a 50k cap. One night my speeds went right down, I phoned up my provider and I got a woman on, she said she would have a look. After a few minutes she said try it now, I did a speed test and they shot up like I've never had before, the next day they had dropped back to normal again, so whatever she did, she must have put it on a timer or something as it dropped back again. It shows they can do it their end without the bull of having to wait for an engineer. I don't know what you have there, but if it's DSL you may have ingress in the line. Old phone lines are notorious for that crap. Also, she probably just reset your modem which you can do yourself. Last edited by CRJ_simpilot; 12-09-2018 at 04:30 AM. Finally redownloaded that massive file again for testing. Yeah, it was just a one off. 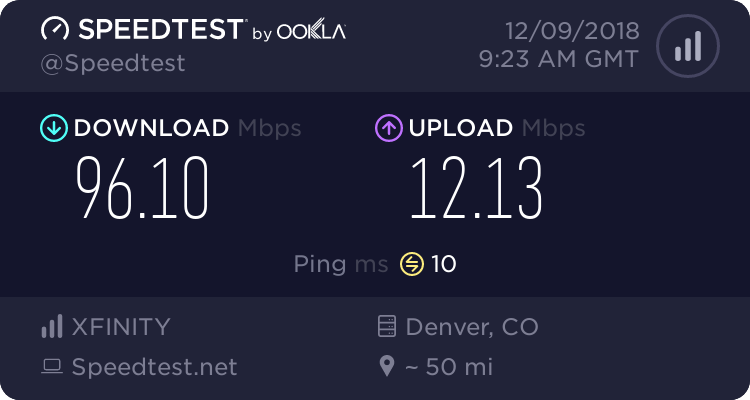 I can actually get somewhere around 200 Mbps, but I wired up the house with 100 Mbps ethernet using just four lines in the cable instead of all 8 for gigabyte speed. I would have to rewire everything. Well, at least redo the connectors to have all four pairs being used, and since I'm color blind it's a PITA to see the color code. I should buy those damn glasses they charge you a fortune for on fleaBay. Last edited by CRJ_simpilot; 12-09-2018 at 04:29 AM. My internet is fed to my house on the old phone lines, I'm waiting for fibre to be connected in my area then I will go on that, it costs more but it will be worth it. It costs a lot to maintain servers and data-centers. Especially for a 20+ year old website like ours that has tons of content to host and serves a huge number of visitors. There's more at play here than simply hosting like backups, power consumption, etc. In light of this, I see no problem in the membership policy of this website. Impressive internet speeds being showcased here! I'd love to have connections like those. These days, I'm making do with speeds of 0.1 Mb/s to 1 Mb/s. It costs a lot to maintain servers and data-centers. You chirped it. I've been amazed at how well Nels and company have done with this site for the last 20 years (and it was here a while before I found it, too), being able to devote full time (at least 3 people, maybe more) to it. It's a great (and very friendly) resource. Now if we could just get you and the previous fellow to follow up and become "First Class" members, This will help to ensure the continuation of the site. You're welcome, Nels! Just send me a check!